Welcome to our new season of Tower Site of the Week - and the latest in a series of TSoTW installments showcasing the images you'll find in the brand-new Tower Site Calendar 2010, arriving any day now in a mailbox near you. This week's installment is one of my favorite AM transmitter sites anywhere in the country, and one I'd long been meaning to visit. For some reason, I haven't been down to the Washington, D.C. area as often as I ought to - and so even though the week I spent down there in August 2008 was supposed to be a "daddy-daughter" trip to introduce my then-not-quite-five-year-old to our nation's capital, I couldn't resist the chance to make a few radio stops along the way. This site on busy University Boulevard in Wheaton, Maryland is, of course, Washington's AM 1500, and while it will forever be "WTOP" to me and to most anyone else who's dialed around an AM radio in the last six decades, it has a long and colorful history that both precedes and follows those famous call letters. 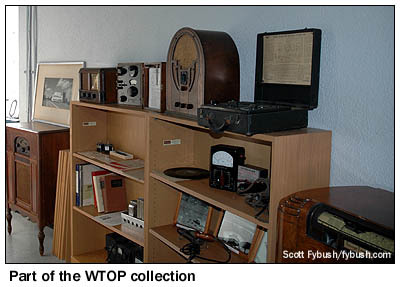 The station's origins go back to 1926 and the Twentieth District Republican Club in New York City, which put a station called WTRC on the air up there. As it turns out, the club was an arm of the Ku Klux Klan, at a time when that group still enjoyed some shreds of legitimacy, and another offshoot of the Klan, the Fellowship Forum, quickly relocated the station to Mount Vernon Hills, Virginia, in the distant suburbs of Washington, where it was known as WTFF. By 1928, WTFF had become WJSV, named for Fellowship Forum leader James S. Vance - and by 1931, WJSV had become a CBS-owned outlet, its early history soon forgotten. The WABC synchronous operation never came to pass, and instead WJSV was relocated to Arlington, Virginia. That site didn't last long, either, because it was in the path of construction for National Airport - and so by 1939, CBS moved WJSV one last time, finding a rural patch of land far outside urban Washington in Wheaton. 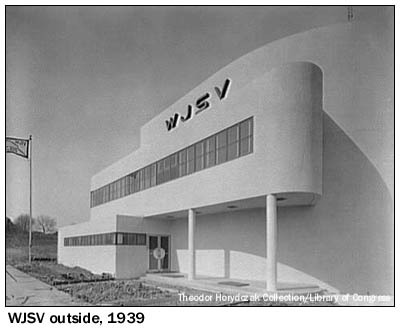 Architect E. Burton Corning was hired to design a showplace facility befitting WJSV's new status as CBS' 50,000-watt flagship signal in the capital city, and what he delivered may be the most remarkable AM transmitter plant ever constructed in the U.S. 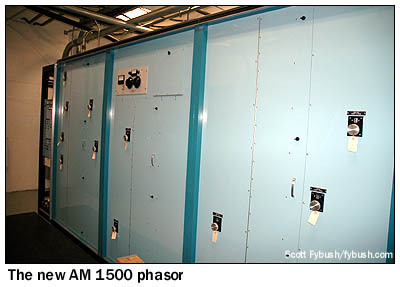 This was an era when visitors were expected to stop by on a regular basis to admire the mighty machinery that generated these big radio signals, and Corning designed a facility that was as impressive as could be imagined back then. Rewind for a moment to 1940, when the building opened, and imagine making a Sunday drive north from the city into the farmland of Montgomery County. Turn off Georgia Avenue onto the narrow road then known as Old Bladensburg Road, and you'll soon see three stately 350-foot towers piercing the Wheaton sky. In front of them, there's a streamlined, bright white Art Deco building, all curvy lines and glass block, with big stainless-steel "W J S V" lettering above the front door. Walk in, and there's a dramatic curved staircase leading you upstairs...where you find yourself in an enormous round room lit by glass-block windows and recessed lighting in the ceiling. Most of the center of the room is occupied by a deep well in which engineers (wearing suits and ties, of course!) 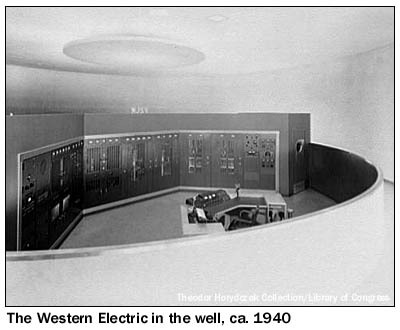 are tending the massive Western Electric 407A transmitter that forms a V-shaped wall across the center of the well - and you can watch them work from all sides as you make your way around the elevated circular walkway that surrounds the well. How solid is this structure? As you leave, your tour guide tells you that if the reinforced-concrete building were tipped on its round side, it could roll down the street in one piece. 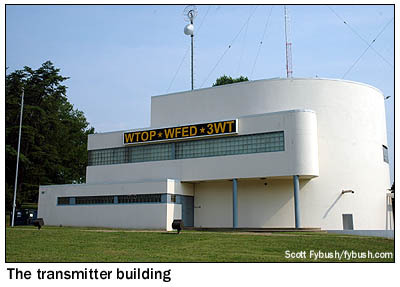 Here's the good news: unlike so many of these early broadcast palaces, the WTOP site has largely been preserved intact over the ensuing seven decades. 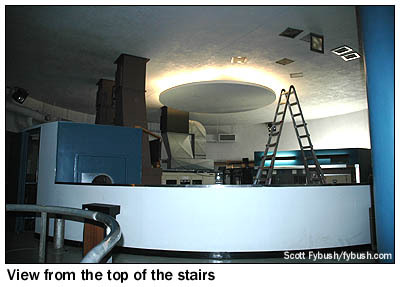 The curved staircase still leads up to the transmitter floor, where a circular walkway still surrounds the equipment, complete with the little stairwell and round-windowed door through which the engineers passed to get down to the transmitter well. 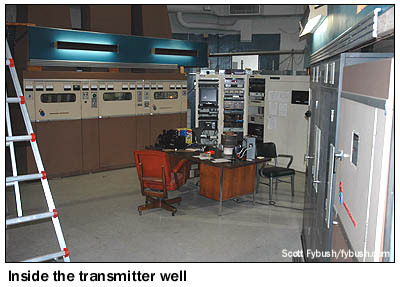 The Western Electric transmitter is gone, of course (though a couple of its cabinets live on as a housing for a phasor built by CSP, the predecessor to today's Phasetek, in the 1970s) - but the well is still home to 50,000-watt transmitters, a Continental 317C and a newer Harris DX50. There's even better news: from day one until his death in 1997, one man was in charge of this site, and his collections of pictures, documentation and equipment have been carefully preserved for display here. Granville "Granny" Klink was WTOP for many decades, joining the station in 1937 and serving as chief engineer beginning in 1951, and today his legacy lines that circular walkway around the transmitters. Klink officially retired in 1978, but remained closely involved with the station and this site, and a few years before his death he sat for a series of fascinating video interviews, which you can see here. There's an ongoing project to scan his scrapbooks, and perhaps someday they'll be available online for closer perusal. Making our way counter-clockwise around the full circle that surrounds the transmitters, we come back around to the little row of offices that sit next to the stairway, behind the Continental, on the left side of the building as seen from the street. 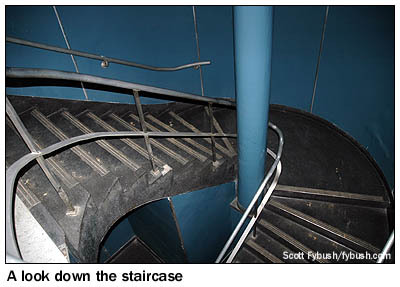 At some point in WTOP's history, the walls back here (and in the stairwell) were repainted from white to a glossy dark blue, but the layout remained more or less the same. 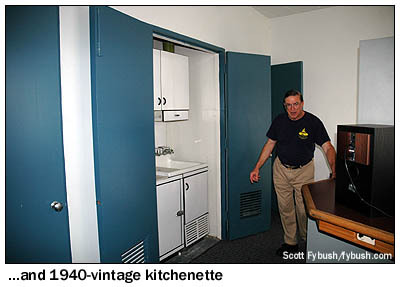 There's still a kitchenette here, and a room that was once a bedroom for stranded engineers (remember, this was out in the countryside back in 1940!) is now being converted into an emergency studio for WTOP should the need arise. 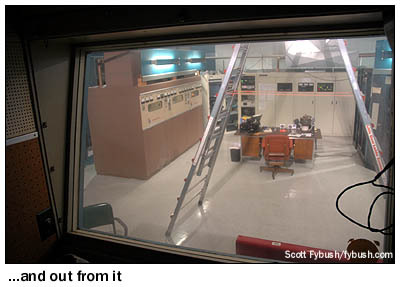 Downstairs, there's a workshop, a garage, a big generator, and several rooms that were once filled by the power transformers and other support gear for the Western Electric. 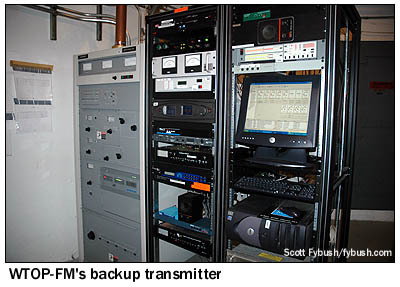 Today, one of those rooms is home to a new Kintronics phasor to replace the CSP unit upstairs, and another room is home to a backup transmitter for what's now WTOP-FM (103.5), which has its main transmitter on the campus of American University in northwest DC. 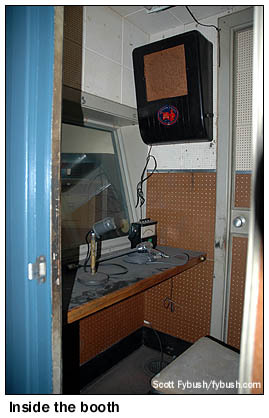 A bit of explanation is in order here: the original WTOP-FM was on 96.3, but unconvinced of FM's future, the Post donated that facility to Howard University in 1971, creating what's now WHUR. 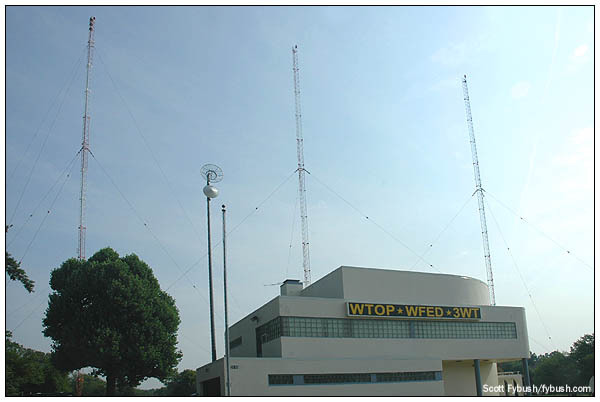 In the nineties, as the Washington metro area sprawled far beyond the area that could receive a clear nighttime signal from WTOP on 1500, the station began simulcasting its all-news format on several suburban FM signals. 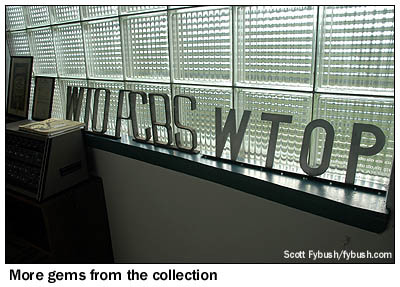 In 2006, WTOP owner Bonneville International moved the calls and the all-news format off 1500 entirely. AM 1500 became WTWP, "Washington Post Radio," in a partnership with the station's former owner, while the former classical WGMS (103.5) became WTOP-FM. 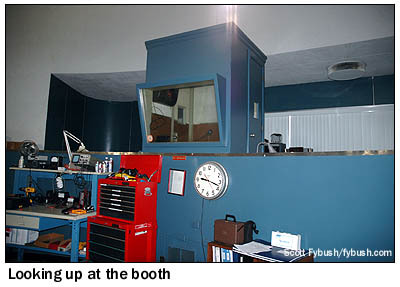 By the time of our 2008 visit, "Washington Post Radio" was history, and the AM 1500 signal had become talker WWWT, "3WT" - and not long after that, 3WT was itself history and 1500 had become the new home of Bonneville's surprisingly successful niche format, Federal News Radio, under the calls WFED. 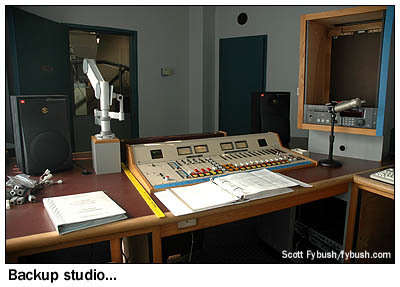 At its new 50,000-watt home on 1500 (with a relay on WWFD 820 in Frederick, Maryland), WFED occupies an interesting niche on the DC radio dial, super-serving the large number of area residents who draw an income from the U.S. government. All those complaints about the WJSV signal from the 1930s still hold true today: while the signal booms up and down the East Coast at night, it's non-existent in many parts of Virginia (and Maryland, too) that were rural farmland in the thirties but are now densely-populated DC suburbs. Those co-channel stations (especially KSTP in Minnesota) that wreaked havoc on the Washington signal back then are still factors today, though a 1990s interference deal with KSTP and co-channel WLQV in Detroit allowed all three stations to loosen up their patterns a bit. It's been a long and sometimes bizarre 83 years from the Klan in Brooklyn to Federal News Radio in Wheaton, and this site stands as magnificent testimony to the sweep of that history. While the staton inside no longer answers to "WTOP" (unless the 103.5 auxiliary transmitter is on the air), this is still an important piece of the Washington radio landscape - and truly a treasure of American broadcasting history. Thanks to Ken Sleeman, formerly of WTOP, and to Brian Oliger and the current Bonneville DC engineering staff for the tour!